Molly turned 6 months old on October 19th! Oh my heart. The weeks are continuing to fly by! Six-month-old Molly is precious and smiley and cute as a button. These days she is grabbing at things, babbling loudly (now with a version of "Mama" and "Dada,"each of which are encouraged enthusiastically), and loves to smile at admirers. 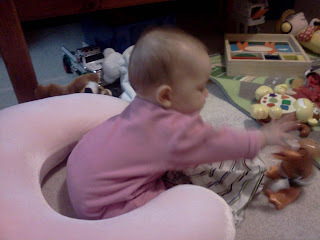 Molly's newest tricks are sitting alone (although she still topples), and blowing "raspberries." Molly is 24 inches long, and weighs 14lbs, 14oz. She is 5th percentile in length and 10-25th in weight... and I have NO idea how she has dropped in those categories since she eats around. the. clock. When I last left you at 4 1/2 months, Molly had started waking to eat at night after being a solid 12-hour sleeper, and I thought it was related to my efforts to combat pregnancy weight. You all gave me some great ideas to boost milk supply, but it took about 2 weeks until became evident that the changes in my milk and milk supply were hormonal changes. (TMI, probably, but I include this in case any one else runs into this experience as a breastfeeding mom- I found this blog helpful). Anyway, long story shortened, Molly was immediately back on track after those 2 weeks, but another 2 weeks after that we started all over again. The second time she never bounced back. I was all over the place trying to figure out why she kept waking up screaming, sometimes hungry sometimes not... Teething? Tummy troubles from solids we'd started? Hungry or habit? I took her to doctor, and treated an ear infection at one point. I guess I've sort of turned into a hippie mom for now. :) She is just so hungry when she wakes up and I can't resist visiting that sweet little face at night, even if I am tired. We are working on solids and a good daytime schedule, and my hope is that she will somehow just surprise me and decide she needs more sleep. :) Oh, and my little diva also decided she is above bottles. We haven't been successful in getting her to take a bottle in two months! Good thing she is so stinkin' cute! No, seriously though, I get all teary eyed watching my babies grow so quickly and can't seem to get them to stop. We are so enjoying baby Molly, restless nights and all. What a gift she is!